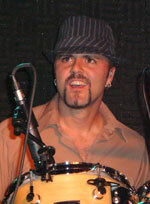 Ryan Inselman is a freelance drummer/percussionist with a music education degree from St. Cloud State University. Ryan has marched with both Minnesota Brass Drum and Bugle Corps. and the Madison Scouts Drum and Bugle Corps. As a member of the nationally recognized band Fade 2 Shade, Ryan performed 250 shows yearly throughout the country. He now tours with Jesse Lang (Johny Langs's younger sister) and continues as a session drummer and a teacher in the Minneapolis/St. Paul area. He has also recorded his own solo percussion CD entitled 'Perfectly Human' that has attained national recognition.